Native to Central and South America, sloths eat, sleep, mate, give birth and raise their young while hanging upside-down in trees. The slowest mammals in existence, they can walk on the ground but only with extremely awkward and unwieldy movements. They’re much better swimmers. Some of their adaptations differ slightly, but both sloth families -- two-toed and three-toed -- are uniquely suited to their slow-paced, arboreal lives. 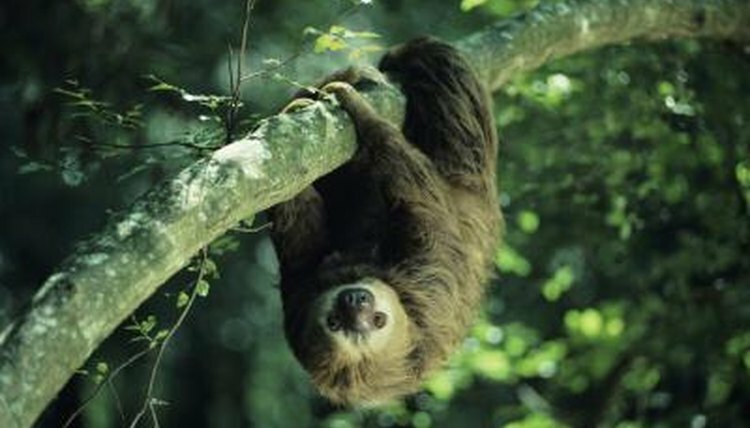 Three-toed sloths have tan coats, while two-toed sloths usually have gray-brown fur. While these tones match tree trunks and branches, the animals have another layer of camouflage: Green algae grow from their hair, enabling them to better blend into the leaves and vines of the treetop canopy. Their extremely slow movements might also help conceal them from predators that rely on vision to hunt. With their slow speed, sloths might seem like easy prey for anacondas, boas, wild cats, eagles and hawks. However, they use their long, sharp claws -- normally used to hold onto branches -- and very sharp teeth to fiercely defend themselves. When they’re in the trees, special adaptations help them spot potential threats. Two-toed sloths can tilt their heads 45 degrees backward to watch for predators. Three-toed sloths have nine cervical vertebrae -- four more than their relatives -- that enable them to rotate their heads 270 degrees to scan for threats. Sloths’ thick, dense coats help keep them dry during the rainy season. An undercoat guards their skin, while the longer, outer hairs hang down at an angle, providing a natural path for water to flow off the animal. Two-toed sloths can vary their body temperature from 75 to 91 degrees Fahrenheit, allowing them to adapt to various weather conditions. Three-toed sloths raise their body temperature by basking. Both two- and three-toed sloths have extremely slow metabolism, enabling them to remain in the same tree for several days before descending to seek more food. They sleep 15 to 20 hours daily and spend the rest of their time foraging for leaves or traveling between trees. They also come down to defecate but only need to do that once every eight days, allowing them to save valuable energy and time.